Viennese-born, Zeisl studied with Joseph Marx and Hugo Kauder whose string quartets, in a melodious idiom related to that of Zeisl, can be heard on Centaur. Zeisl was part of the Jewish diaspora set running by the remorseless Nazi bow-wave of the 1930s. He fetched up in the USA between New York and California the scene of his Piano Concerto. Zeisl's three movement Piano Concerto is highly romantic, lapidary, discursive, eulogistic and very busy for the soloist. It's insistently pummelling in the first movement which at various times recalls Rachmaninov or Stravinsky or Prokofiev. The half cut-glass and half stony reports of the piano invoke the world of dreams in the middle movement. The angular dissonant rhetoric of the solo piano at the start of the Pesante finale makes for quite a contrast. One might be listening to the darkling druidic soliloquising of John Ireland or of Sorabji. The rest of the movement is garish and bright. In this sense it recalls Shostakovich in his victorious oratory in the Second Piano Concerto and Rachmaninov in his Third Piano Concerto. It's quite a triumphant piece of peroration writing. Pierrot in der Flasche is a lighter-hearted and confident Straussian romp. Without Richard II's heavier syrup it is reminiscent a little of Siegfried Wagner's wheezy-witty folktale drolerie. It's quite dreamily luscious in the Oriental love-scene movement though by no means impressionistically exotic. 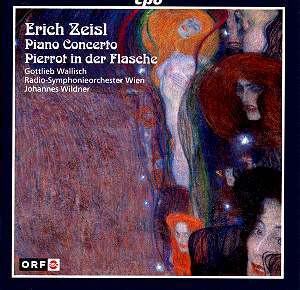 CPO have previously recorded Zeisl’s lieder. The best known of his works is the Requiem Ebraico famously recorded in 1999 by Lawrence Foster with the Berlin Radio Symphony Orchestra alongside Waxman’s Song of Terezin as part of the Decca Entartete musik series (00289 4602112).